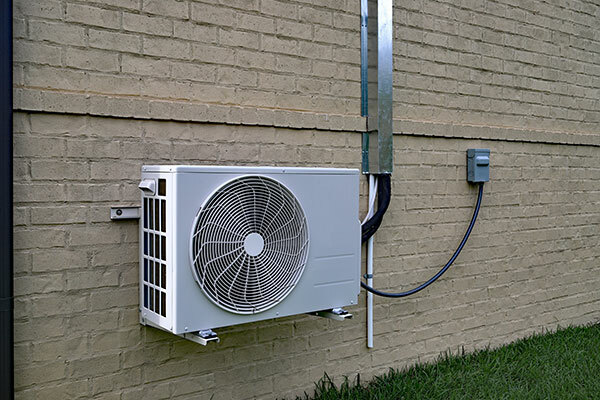 The outdoor heat pump unit. Streamlined indoor units that are mounted unobtrusively on an upper wall. Can be ducted just like central heating and air. BPP has found mini split heat pumps to be very reliable, easy to use and straightforward to maintain. Plus, mini splits qualify for energy efficiency rebates and affordable financing. Main areas, including master bedrooms and living rooms. Mini splits are controlled using intuitive remote controls that can adjust temperature, mode, fan speed and airflow. Many units have additional energy-saving features including economy mode, which uses infrared sensors to detect when rooms are not occupied and reduce active heating or cooling. The vents can be configured in different directions, wide angles and vertical sweeping to distribute conditioned air evenly. The exterior unit is mounted on brackets and connected to the interior unit via a conduit. These units can be strategically placed to minimize noise for seamless heating and cooling. In many bedroom installations, the exterior unit is often mounted to the home next to a different room to maximize quiet performance. Units are equipped with “smart Inverter technology” that adjust fan speeds to meet demand, running at a 30% better efficiency than single speed fans. The indoor mini split units are equipped with filters that freshen indoor air and minimize dust and allergens in the air. Built-in humidity controls can remove excess moisture in the air, provide comfort and eliminate potential mold and mildew problems. Thinking about adding a mini split heat pump for added comfort? Contact BPP to find out more about these efficient solutions. Call us at (925) 256-1092 or submit our online contact form.